Copa America Centenario, 2016 Centennial Copa America is an association football tournament will be hosted in United State of America between 3rd June and 26th June 2016. Officials announced Complete Schedule, which is listed below as re written to Indian Standard Time(IST). 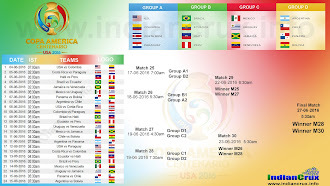 2016 Copa America Centenario Match Schedule in Indian Standard Time with live results and scores are here with downloadable JPG and PDF formats. The first Match of Copa America Centenario 2016 USA is between Host Nation, United State of America and Colombia on 3rd June 2016 at 9:30pm Local Time (EDT). And it will be on 4th June 2016 in India at 07:00am Morning (IST). According to Indian Standard Time, All the matches of Copa America Centenario will be at morning (between 02:30am and 08:00am). 2016 Copa America Centenario Final match will be on 27th June 2016 at 5:30am in Indian Standard Time. Copa America Centenario is the special tournament celebrating Centenary of CONMEBOL and Copa America. Copa America Centenario will be the 45th edition of Copa America. This is the special edition between the usual 4years cycle. In Centenario 2016, there are 16 teams participating (12 actually in Copa America). there are 10 venues were selected from USA for this biggest centenarian celebration. All the 16 teams were classified in to four groups with four teams equally. United State of America, Colombia, Costa Rica and Paraguay are in Group A. Brazil, Ecuador, Haiti, Peru are in Group B. Mexico, Uruguay, Jamaica and Venezuela are in Group C. Argentina,Chile, Panama and Bolivia are in Group D. This is the team pagination after the final draw of Copa America Centenario 2016. Sony ESPN won the Broadcasting License in India to Broadcast Copa America Centenarian Soccer Carnival. In USA, the hosting nation, Fox Sports and Uni vision are the Official Broadcaster of Copa 2016 Centenario in English and Spanish Respectively. Sony Kix is very popular in India through IPL live Broadcasting with Indian languages. Please inform me if any errors or mistakes found in "2016 Copa America Centenario Match Schedule in Indian Standard Time (IST)"
Yet you haven't named the winner of Copa America and that is Messi's Argentina. Messi loosed the penalty kick, unfortunately its happens once again, Chile won the match through the Penalty shoot out.